Bluva&apos;s Accu-Swiss Bellecombe is a new collection that was introduced in 2014 and for this year has some new options, including the Accus-Swiss Bellecombe ref. 65R164, which, in my opinion, is a really nice mixture of style and value when looking for a solid lady&apos;s timepiece. 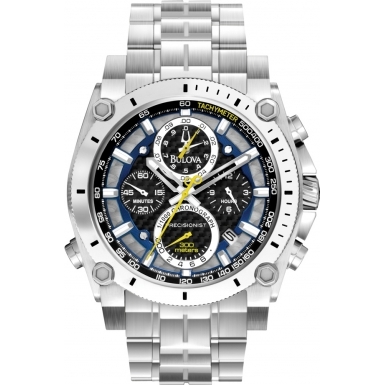 The Accu-Swiss family of watches under the larger Bulova brand all have Swiss-made movements, whether they are quartz or mechanical - in contrast to most other Bulova watches that contain mechanical or quartz Japanese movements. Inspired by late-era art deco watches, the Bulova Bellecombe collection has smaller 31mm-wide case sizes as well as this new larger size, which is about 35-36mm wide without the crown. 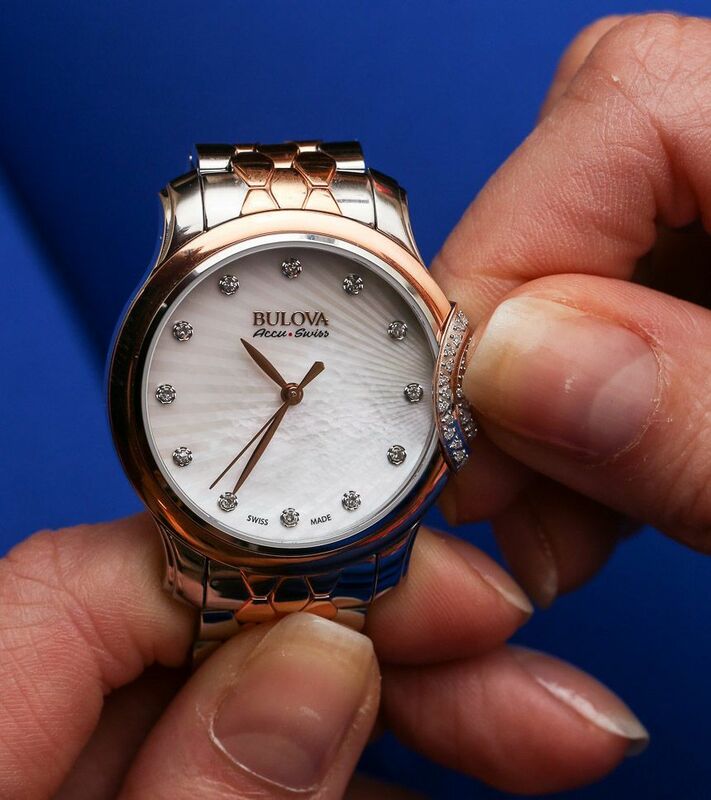 These latest Bulova Bellecombe watches also get diamond hour markers and a new patterned mother-of-pearl dial with a sunray motif that emanates from the crown. Speaking of crown, this is where you&apos;ll find the Bulova Bellecombe&apos;s most distinctive feature - a double border of sorts, which frames the crown in two rows of diamonds. There is a white cabochon in the crown which adds to the feminine personality of the watch. Without this crown structure, the Bulova Bellecombe would be a much less distinctive timepiece. With this unique design element, Bulova was able to create a familiar and legible dial with just enough uniqueness to make the person wearing it not feel overly conservative. The Bulova Bellecombe&apos;s steel case is offered in a series of styles, including this two-tone model which mixes polished steel with a rose gold tone. This particular ref. 65R164 Bulova Bellecombe has 42 diamonds on the case and dial - according to Bulova, are all set by hand - which is nice in a watch at this price point. I happen to think that it is a welcome feature to have diamond hour markers in a women&apos;s watch, along with helping legibility. This newer Bulova Bellecombe&apos;s dial is easy to read, but I think it might have benefited from luminant on the hands for darkness viewing. Over the dial is a sapphire crystal. Inside Bulova Bellecombe watches are Swiss quartz movements that offer just the time for a clean-looking dial. Attached to the cases are steel bracelets which are inspired by historic Bulova watch bracelets. This new interpretation of a classic design can be found on both men&apos;s and women&apos;s Bulova watches in the Accu-Swiss product family today. The bracelet style further offers a pleasant tactile experience, with no sharp edges and a smooth feeling when you run your fingers over it. This bracelet closes with a butterfly-style deployant. If this two-tone Bulova Accu-Swiss Bellecombe isn&apos;t for you, then Bulova also offers the all polished steel reference 63R147 in addition to the pictured 65R164. As a man writing about a women&apos;s watch, I can only describe what I like about it and its value proposition, even though I am not the person Bulova is targeting to wear it. For this reason, I thank my lovely model who has most enjoyed wearing it and has praised the Bulova Bellecombe&apos;s comfort, legibility, and versatile style.